PACCAR Achieves Record Annual Revenues and Profits - DAF Trucks N.V.
PACCAR’s North American and European customers are benefiting from good economic growth, strong freight tonnage, lower fuel prices and the superior operating efficiency of Kenworth’s, Peterbilt’s and DAF’s industry-leading trucks. U.S. and Canada Class 8 truck industry retail sales in 2015 of 278,000 vehicles were the highest since 2006. Europe above 16-tonne registrations in 2015 of 269,000 vehicles were the highest since 2008. PACCAR achieved record revenues of $19.12 billion in 2015 compared to revenues of $18.99 billion in 2014. PACCAR reported record net income of $1.60 billion ($4.51 per diluted share) in 2015, an increase of 18 percent compared to $1.36 billion ($3.82 per diluted share) earned last year. Fourth quarter 2015 net sales and financial service revenues were $4.36 billion compared to $5.12 billion for the same period in 2014. PACCAR earned $347.2 million ($.98 per diluted share) for the fourth quarter of 2015 compared to $394.3 million ($1.11 per diluted share) in the fourth quarter of 2014, which reflects lower truck deliveries in North America, partially offset by increased deliveries in Europe. PACCAR declared cash dividends of $2.32 per share during 2015, including a special dividend of $1.40 per share. Total dividends were the highest in company history. The regular quarterly dividend was increased by 9 percent in September 2015. Total dividends per share increased by 25 percent compared to the prior year. PACCAR’s 2015 total dividends provide a yield of over 4 percent, which is in the top 100 companies in the S&P500. PACCAR has paid a dividend every year since 1941. PACCAR repurchased 3.85 million of its common shares for $201.6 million in 2015. Under the current Board of Directors resolution authorizing $300 million of stock repurchases, PACCAR has repurchased 2.72 million shares for $136.3 million. “PACCAR’s excellent net profits and strong cash flow make the company’s shares an attractive long-term investment. The stock repurchase program reflects the Board’s confidence in PACCAR’s successful global business growth,” said Bob Christensen, PACCAR president and chief financial officer. PACCAR delivered 154,700 vehicles worldwide. DAF delivered its one millionth truck. 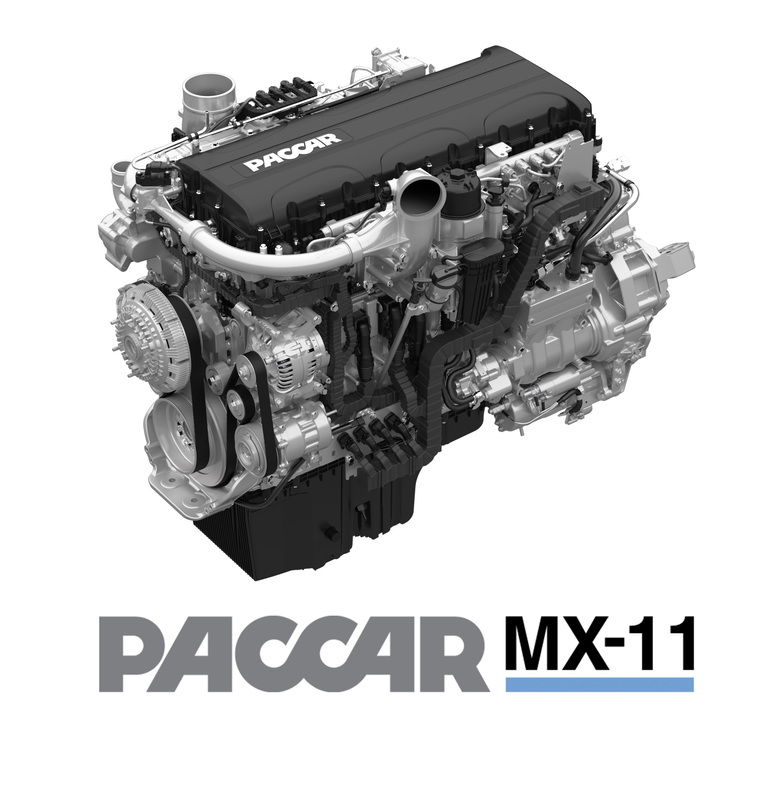 PACCAR announced the launch of the PACCAR MX-11 engine in North America. PACCAR’s Mississippi engine factory produced its 100,000th PACCAR MX-13 engine. DAF’s Leyland truck factory produced its 400,000th truck. Peterbilt’s Denton manufacturing facility celebrated 35 years. PACCAR was recognized as a technology leader in InformationWeek magazine’s “2015 Elite 100 Companies.”PACCAR invested $548.2 million in capital projects and research and development. PACCAR Leasing celebrated 35 years and began operations in Australia. 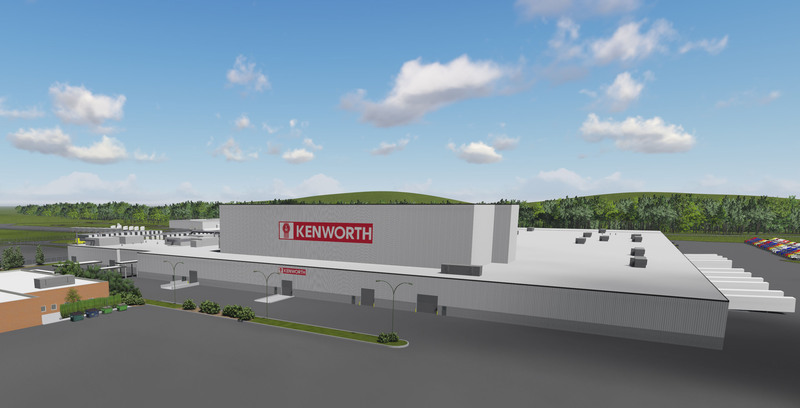 PACCAR launched Kenworth TruckTech+ and Peterbilt SmartLinq connected truck systems. PACCAR has implemented over 30,000 Six Sigma projects since 1997. Quarterly consolidated net sales and revenues of $4.36 billion. Net income of $347.2 million. Cash provided by operations of $704.8 million. Financial Services pretax income of $89.9 million. Research and development expenses of $66.7 million. Capital investments of $127.3 million. Manufacturing cash and marketable securities of $3.38 billion at December 31, 2015. Record consolidated net sales and revenues of $19.12 billion. Record net income of $1.60 billion, an 8.4% after-tax return on revenues. Record year-end stockholders’ equity of $6.94 billion. Record PACCAR Parts pretax income of $555.6 million. Record dividends declared of $819.8 million. Financial Services pretax income of $362.6 million on assets of $12.25 billion. Medium-term note (MTN) issuances of $1.92 billion.Record cash provided by operations of $2.56 billion. “Class 8 truck industry retail sales in the U.S. and Canada were a robust 278,000 units in 2015, compared to the 250,000 vehicles sold in 2014,” said Gary Moore, PACCAR executive vice president. “Truck demand is being driven by good economic growth, strong freight tonnage and lower fuel prices. In 2015, PACCAR achieved a Class 8 retail market share in the U.S. and Canada of 27.4 percent as customers benefited from Kenworth and Peterbilt vehicles’ excellent fuel efficiency and outstanding performance. Estimates for U.S. and Canada Class 8 truck industry retail sales are for another good year in 2016 with sales in the range of 230,000-260,000 units, driven by ongoing economic growth and customers’ focus on achieving enhanced operating efficiency with new Peterbilt and Kenworth trucks,” added Moore. DAF Brasil increased production, market share and backlog, and began local assembly of the versatile DAF CF Series and PACCAR MX-13 engine in 2015. “DAF Brasil had a good year with a successful Fenatran truck show in November, resulting in many new orders,” said Marco Davila, PACCAR vice president. 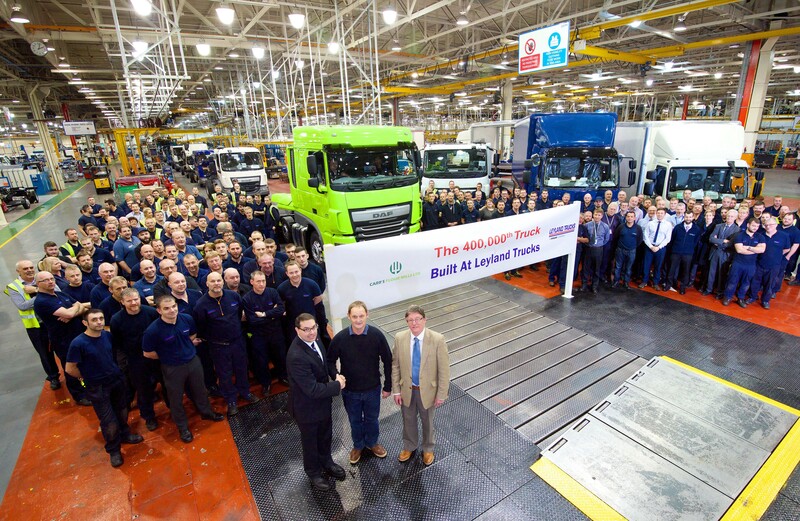 DAF produced its 400,000th truck at its Leyland, U.K. assembly facility in November 2015. The Leyland facility was opened in 1980 and manufactures premium-quality DAF XF, CF and LF trucks for the U.K., European and export markets. The milestone vehicle was a fuel-efficient DAF XF powered by a PACCAR MX-13 engine. “The production and delivery of our 400,000th truck highlights another outstanding year for Leyland. Leyland employees deliver the highest quality vehicles in the industry to our customers,” said Bryan Sitko, Leyland managing director. PACCAR is an environmental leader with its energy-efficient vehicles and manufacturing facilities. PACCAR joined the CDP (formerly known as the Carbon Disclosure Project) in 2014. The CDP’s climate change program provides annual reports on companies’ progress in the development of energy-efficient operations and environmentally friendly products and services that protect and preserve the environment. PACCAR earned a disclosure score of 97 (out of 100) and a performance score of A- in 2015, placing it in the top 5 percent of globally reporting companies. “This is an excellent result and reflects PACCAR’s commitment to environmental leadership,” commented Carole Robbins, PACCAR environmental manager. 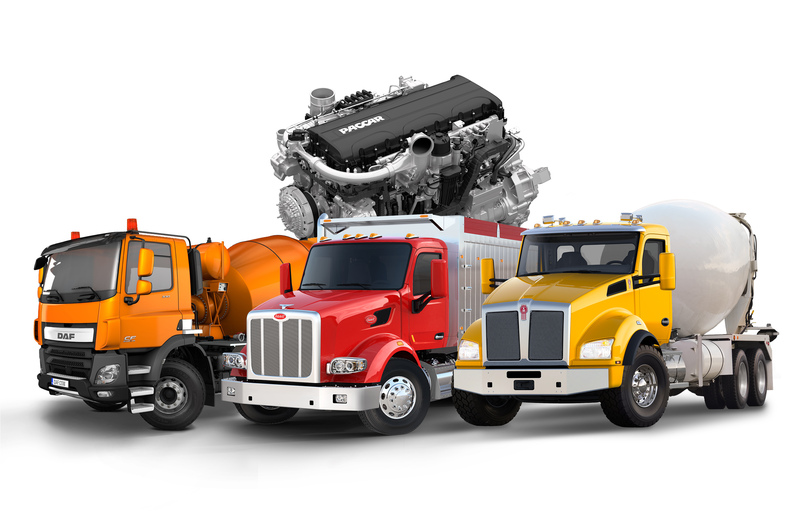 PACCAR has installed over 105,000 PACCAR MX-13 engines in Kenworth and Peterbilt trucks in North America since the start of production at the PACCAR Mississippi engine factory in mid-2010. In the fourth quarter of 2015, the PACCAR MX-13 engine was installed in 42 percent of Kenworth and Peterbilt heavy-duty trucks. PACCAR’s exceptional long-term profits, strong balance sheet, and intense focus on quality, technology and productivity have enabled the company to invest $6.0 billion in world-class facilities, innovative products and new technologies during the past decade. 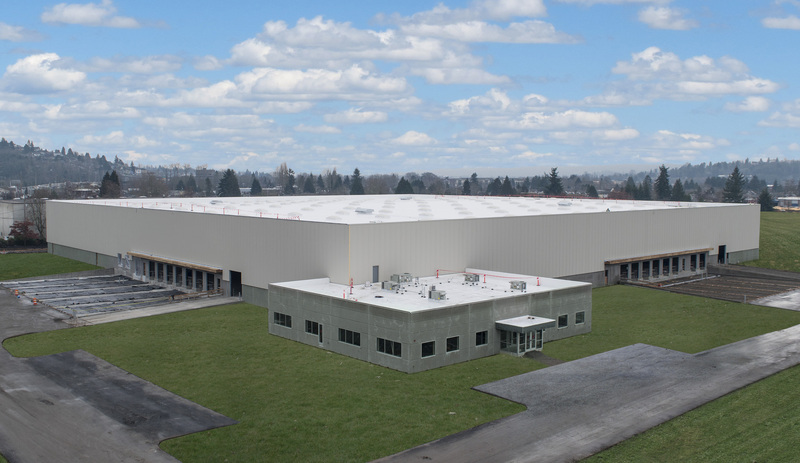 “Capital of $308.4 million and R&D expenses of $239.8 million were invested in new products and enhanced manufacturing facilities in 2015,” said George West, PACCAR vice president. In 2016, capital expenditures of $325-$375 million are targeted for enhanced aftermarket support, manufacturing facilities and new product development. Research and development expenses are estimated at $240-$270 million in 2016. PACCAR Financial Services (PFS) has a portfolio of 175,000 trucks and trailers, with total assets of $12.25 billion. PacLease, a major full-service truck leasing company in North America and Europe with a fleet of over 39,000 vehicles, is included in this segment. “Excellent portfolio performance contributed to strong PFS results in 2015,” said Bob Bengston, PACCAR senior vice president. PFS achieved fourth quarter 2015 pretax income of $89.9 million compared to $96.3 million earned in the fourth quarter of 2014. Fourth quarter 2015 revenues were $292.8 million compared to $302.0 million in the same quarter of 2014. PFS earned $362.6 million of pretax profit in 2015 compared to $370.4 million in 2014, and full year revenues were $1.17 billion compared to $1.20 billion for the same period a year ago. “PACCAR’s strong balance sheet, complemented by its A+/A1 credit ratings, enables PFS to offer competitive retail financing to Kenworth, Peterbilt and DAF dealers and customers in 22 countries on four continents,” said Todd Hubbard, PACCAR Financial Corp. president. PACCAR Financial Services has excellent access to the debt markets, issuing $1.92 billion in three-, four- and five-year term notes during 2015. DAF is cooperating with the European Commission and is preparing its response to the Statement of Objections issued in November 2014. The Statement expressed the Commission’s preliminary view that all major European medium- and heavy-duty truck manufacturers had participated in anticompetitive practices in the European Union. The Commission indicated that it will seek to impose significant fines on the manufacturers. The Commission will review the manufacturers’ responses before issuing a decision. Any decision would be subject to appeal. The company is unable to estimate the potential fine at this time. PACCAR will hold a conference call with securities analysts to discuss fourth quarter earnings on January 29, 2016, at 9:00 a.m. Pacific time. Interested parties may listen to the call by selecting “Q4 Earnings Webcast” at PACCAR’s homepage. The Webcast will be available on a recorded basis through February 5, 2016. PACCAR shares are traded on the Nasdaq Global Select Market, symbol PCAR. Its homepage is www.paccar.com.